A vehicle is a major purchase. Other than a house, it’s the largest investment most people ever make. As an owner, you want your car, truck or SUV to operate at peak performance at all times. Reaching that highest level of efficiency requires a commitment to regularly maintain all components of your motor vehicle as the car’s manufacturer recommends — including the tires. 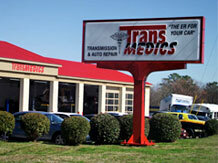 At TransMedics, we’re known for our outstanding transmission service. But, did you know our certified, professional mechanicals specialize in tires, too? That’s right — in addition to our premier work with transmissions, brakes and car repair, TransMedics is also Raleigh’s trusted source for all things tire! Tires that function properly provide drivers a whole host of benefits. First of all, good tires grab the road better and provide outstanding traction, gripping the road under even the worst driving conditions. In addition to the safety benefits, new or good tires help boost gas mileage, as worn tires make the car’s engine work harder to get from Point A to Point B. Also, if you’re a commercial client, be sure to ask about our tire services available for fleets! We’re available to provide sales, service and support for all the leading tire brands, including Michelin®, Goodyear®, BFGoodrich® and more. There’s no appointment needed to shop for tires. Stop by and see us at 5120 Old Wake Forest Road — or, if you’d like to speak with one of our tire specialists directly, contact us to schedule an appointment for a free consultation. We can help you find the right tires at the right price!